Missing teeth? Look no further! 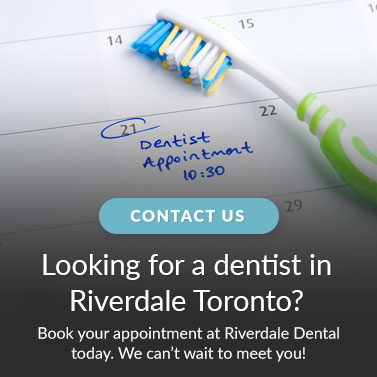 Riverdale Dental in Toronto provides full and partial dentures for patients that are missing teeth and would like to improve form and function of the mouth. Dentures are removable teeth designed to replace missing teeth. Your Riverdale Dental dentist may recommend full (complete) dentures or partial dentures, depending on how many natural teeth you have lost. Dentures can be created to match your existing teeth, so they blend nicely with your natural surrounding teeth. Full dentures are appropriate to have when all of your teeth are missing, and partial dentures are used when some natural teeth still remain. Dentures are a support structure for the facial and lip muscles from sagging or sinking into the face. Dentures improve mouth and jaw mobility, greatly improving the ability to bite, chew, and speak. Dentures improve the appearance of your teeth, allowing you to smile confidently and freely.